Rusted Barn Stars add the perfect primitive, country, and shabby chic touch to your home. These rusted metal stars are very sturdy and durable and made from 22 gauge steel. These are authentic rusted metal barn stars and not painted. These rusted barn stars will be a huge decorating success displayed on your home or barn. Enjoy the relaxed feeling these stars will bring. Authentic rusted Barn Stars from 10" to 10'! These stars are carefully made by actually rusting the metal. Rusted metal barn stars leaves the impression of a rustic rugged look that is sure to fit in your rustic home decor perfectly. 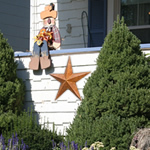 These 16" rusty barn stars are a vibrant way to decorate. It brings a subtle feel to any room in your home and garden decor. Rusted barn stars will offset all the colors in your country decor. These stars are a wonderful accent piece to your home and garden decor. Rusted barn stars will grace your country home decor. These stars will be well loved in your home. Enjoy the relaxed feeling these stars will bring. Rusted barn stars add a unique and calming touch to your rustic home decor. Create the perfect primitive country rustic setting. Rusted large barn stars will stand out in your home. You will achieve the primitive or rustic look you desire with these large stars. This is a BIG star and will be a large decorating success displayed on your home or barn. Enjoy the relaxed feeling these large rusted stars will bring. 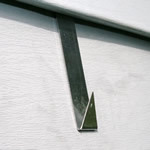 A quick easy solution to hanging your metal barn stars and other decorative items for holidays and your home and garden decor on your vinyl siding!